What is leveling and Why are we doing this? Leveling for Moai means the build plate exert sufficient pressure on the vat bottom layer such that the printed object can stick well on the plate surface leading to a successful result. Without good leveling, print will fail. The good news is that once you set the leveling correctly, you rarely need to go back and adjust again. To measure the pressure from build plate, we print 4 cylinders, one at each corner of the build plate and then measured the height. The higher the pressure, the shorter the cylinder would be as the object was compressed slightly when initial layers are printed. The cylinder (pegs) length represents the amount of the pressure that is on the vat and the letterings identify the spots on the vat. 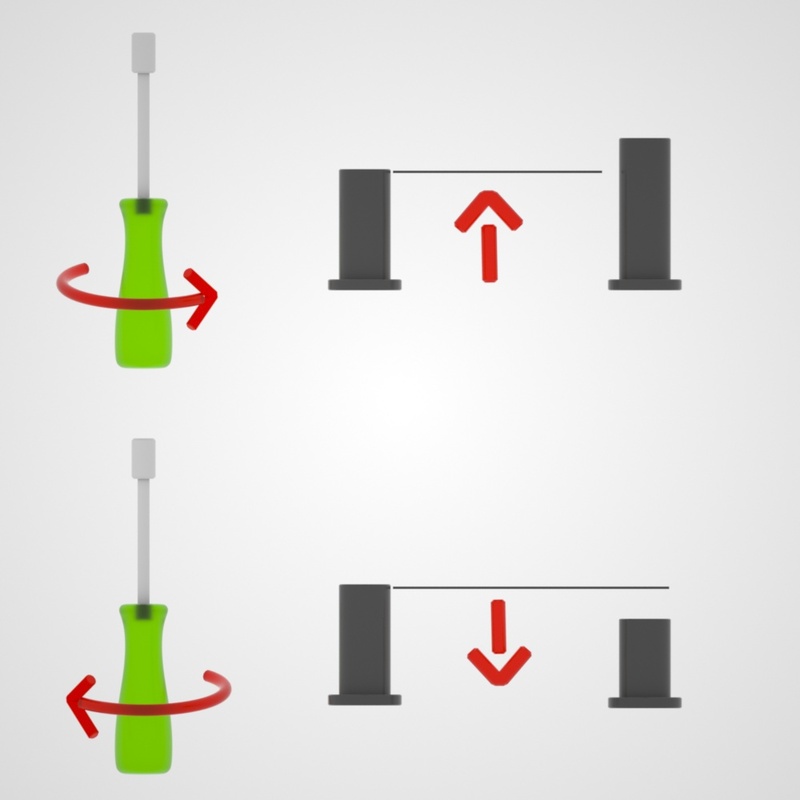 The shorter the cylinder, the higher the pressure because the cylinder is being compressed more. Our goal for Moai is to have all 4 cylinders printed and their heights are between 10.6 - 10.8mm with PDMS vat and 10.5 - 10.9mm with FEP vat. We can accomplish by turning the 4 screws underneath the vat platform. You should already have your printer manually leveled as close as you could get it with the above procedure. Your Z Reset Position should be 1877.
download this gcode file, put it on an SD card and insert it into the printer. If you are using some 3rd party Resin or for some random reason need the actual .STL file, here it is. Set laser power to 58 if you are using Peopoly Model Resin. If not, check exposure list for your resin. The length and the letter of the cylinder represents the build plate pressure of a particular spot. The higher the pressure, the shorter the cylinder. The ideal plate pressure would lead to cylinders with 10.6 to 10.8mm height, with 10.7mm preferred height. If it is under 10.5mm, that means there is too much pressure on the print. You may find your PDMS layer is wearing out faster than it normally would. In some cases too much pressure on the PDMS layer causes artifacts and shifted layers. Now that you know what your heights for each of the corner are, you have 4 possible scenarios. User Apotessar on the forums created an Excel Worksheet you can use, you will need to save a local copy so you can edit it first. Let’s say they are 10.35, 10.31, 10.32, 10.39. 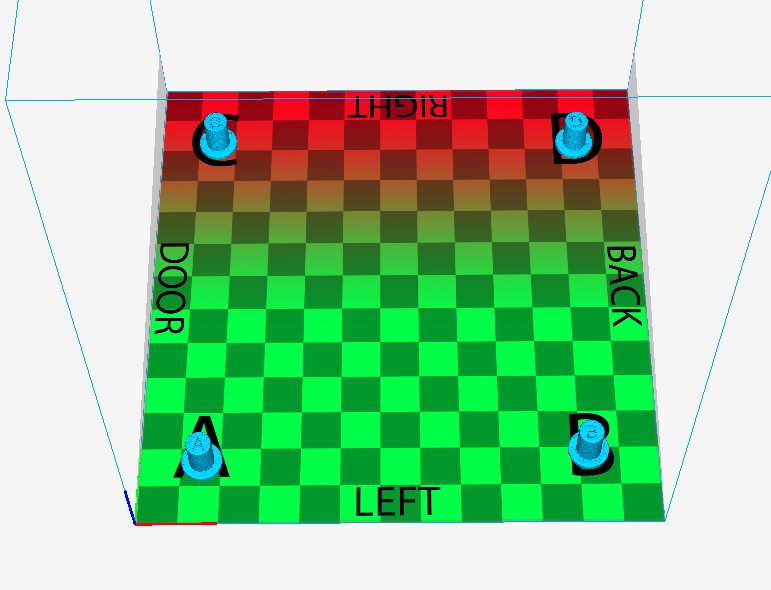 This shows the plate is relatively parallel to the PDMS layer; only the height needs to be adjusted. In this case, you can add 0.35mm to each corner’s height by tightening the nuts (clockwise turn when looking up to the bottom of vat) by half turn (180 degrees). 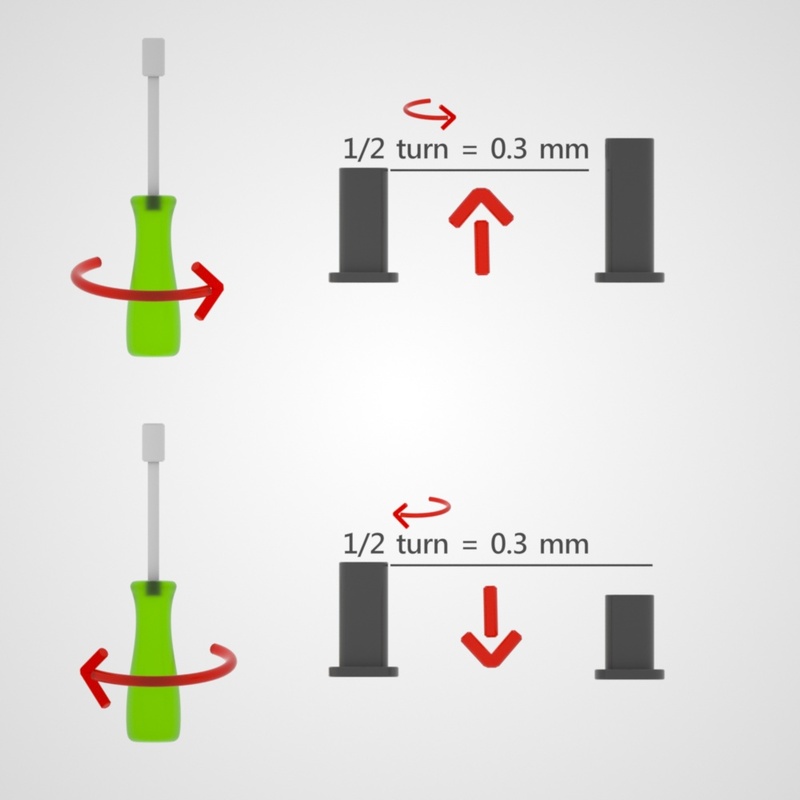 Each full of the nut represents 0.7mm change in cylinder's printed height. If the setting is ok and there are is no damage to the vat, go ahead and adjust the corner that was printed calculating the difference in height between current height and target height. For the failed corner, do a full turn of loosening the nut. Repeat the process. The goal of this process is to get the vat to actively press against the build plate with equal pressure. The vat holder has springs that will push it up towards the build plate. You will be adjusting the nuts that raise and lower the vat to make sure there is no space and the build plate is pressing against the vat with optimal force. There are slight variations in build plates and vats, it is important to level before doing any prints with resin. You might not need to re-level when you are changing vats. We have tested it at Peopoly HQ with switching out several different vats and we didn't need to re-level, so you might try to switch vats without leveling, but if you have problems, level it! You should still do the Leveling Check process shown below to fine tune your leveling, even if you change vats. If you haven't seen Practical Printing's excellent video on how to level, I would tell you to go watch this first so you see what all the steps are! Leveling is THE hardest part of SLA printing and THE most crucial part. Please take your time. (OPTIONAL) If you want to turn the printer completely upside down so its easier to get to the underside of the vat, do that now. Just lift the printer and put it on its top cover. You cannot have resin in the printer of course, it will spill when you flip it upside down. If the Z Reset Position is already 1880, set it to 1879, and then go back to 1880 and double press the knob and the Build plate will start to move. If there is any loud noise or Plate is going too low such it is hitting and keep press vat, press the power button off. Otherwise, just let the build plate press against the vat and stop. Before doing the next step, make sure the build plate is already lowered into the vat. If not, go back to the last step. Use a piece of paper to ensure there is no space between the nut and the metal plate. If you cannot fit a piece of paper between them, you are good. This last step of Changing the Z Reset Position from 1880 to 1877 decreases the amount of pressure the build plate puts on the vat. You are done resetting the level, you would need to do the above “Leveling Check and Adjust” step.